ww2dbaseMatome Ugaki was born in Okayama Prefecture, Japan. He graduated from the naval academy in 1912 and the Naval Staff College in 1924. Between 1928 and 1930, he served in Germany. As the Pacific War broke out, he became a key figure in the Japanese Navy as the Chief of Staff to Admiral Isoroku Yamamoto. When Yamamoto's aircraft was shot down in Apr 1943, Ugaki was also present, but he survived the ordeal. In Oct 1944, he commanded the First Battleship Division, which included Yamato and Musashi, in the Battle of the Sibuyan Sea. ww2dbaseNear the end of the war, Ugaki was the commanding officer of the 5th Air Fleet, directing the kamikaze special attacks against Allied ships off Okinawa. Given the dire situation, he was proud of the development of the special attack; he noted in his diary that "I'm glad to see that, as the situation becomes critical, this kind of attack method comes to the fore without compulsion, thus displaying the glorious way of warriors..., the real spirit of a Japanese warrior." Despite his belief in the kamikaze spirit, he was frustrated with its failure to stop the American advance. On 14 Aug 1945, against the protest of his lieutenants, he sent himself on a special attack mission. "I'm going to follow in the footsteps of those many loyal officers and men who devoted themselves to the country, and I want to live in the noble spirit of the special attack." Donning a simple uniform without any rank insignia and carrying only binoculars and a samurai sword given to him by Yamamoto, he climbed into the backseat of an aircraft destined for a kamikaze mission. Warrant Officer Akiyoshi Endo, whose opportunity to die in a special attack was taken by Ugaki, protested insubordinatingly. "I have relieved you", Ugaki ordered. "You will stay." Endo continued to defy him, however, forcefully climbing into the Suisei dive bomber and squeezed himself in the same space that the admiral had already occupied. Moved, Ugaki shifted in the seat to allow the extra passenger. En route, Endo, the radioman, helped Ugaki send out the admiral's final message. ww2dbase"I alone am to blame for our failure to defend the homeland and destroy the arrogant enemy. The valiant efforts of all officers and men of my command during the past six months have been greatly appreciated." ww2dbase"I am going to make an attack at Okinawa where my men have fallen like cherry blossoms. There I will crash into and destroy the conceited enemy in the true spirit of Bushido, with firm conviction and faith in the eternity of Imperial Japan." ww2dbase"I trust that the members of all units under my command will understand my motives, will overcome all hardships of the future, and will strive for the reconstruction of our great homeland that it may survive forever." ww2dbase"Long live His Imperial Majesty the Emperor!" ww2dbaseAt 1924, Endo sent a message that they were entering a dive on an American vessel. However, American records did not indicate any successful kamikaze attack that day. Sadly for Ugaki, his aircraft likely had crashed into the sea. ww2dbaseIn retrospect, Ugaki's decision to participate in a kamikaze mission on 14 Aug 1945 was rather peculiar, for that by that date he had already received advance notice of the Emperor's intention to surrender. Upon learning of this intention, the action could be viewed as an act of defiance to the Emperor's wish. Had he succeeded in sinking an American warship at this late date, it could have complicated the negotiations in the final days of the war. ww2dbaseSources: the Divine Wind, Fading Victory. 1 Jan 1890 Matome Ugaki was born. 10 Oct 1939 Vice Admiral Matome Ugaki was named the chief of staff of Admiral Shigetaro Shimada at Kure Naval District, Japan. 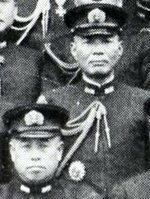 11 Aug 1941 Matome Ugaki was named the chief of staff of the Japanese Navy Combined Fleet. 20 Aug 1941 Vice Admiral Matome Ugaki stepped down as the chief of staff of Kure Naval District, Japan. 12 Jan 1942 Japanese light cruiser Oi hosted Rear Admiral Matome Ugaki as he visited her unit. During the trip, Ugaki expressed disapproval for the use of cruisers as torpedo vessels. 10 Sep 1942 Matome Ugaki arrived at Rabaul, New Britain to meet with officers of the Japanese Navy 8th Fleet, Japanese Navy 11st Air Fleet, and Japanese Army 17th Army. 12 Sep 1942 Matome Ugaki observed activities of the personnel of the headquarters of the Japanese 11th Air Fleet at Rabaul, New Britain. 31 Dec 1942 Matome Ugaki's diary entry made on this date looked back on 1942. "How brilliant was the first-stage operation up to April! And what miserable setbaks since Midway in June! The invasions of Hawaii, Fiji, Samoa, and New Caledonia, [the] liberation of India and destruction of the British Far Eastern Fleet have all scattered like dreams. Meanwhile, not to speak of capturing Port Moresby, but the recovery of Guadalcanal... turned out to be impossible." 12 Apr 1943 Matome Ugaki became sick with dengue fever and was ordered to remain in bed at Rabaul, New Britain. 13 Apr 1943 Matome Ugaki, still recovering from dengue fever at Rabaul, New Britain, was given permission by the doctor to leave his bed. 10 Feb 1945 The Japanese Navy 5th Air Fleet was formed with the strength of eight air groups with Vice Admiral Matome Ugaki in command and Captain Toshiyuki Yokoi as his chief of staff; it was attached to the Combined Fleet. 14 Aug 1945 Seven aircraft of the Oita Detachment, 701st Air Group, Japanese Navy made the last operational suicide sortie of the war, led by Admiral Matome Ugaki, commander of the 5th Air fleet. This is a incredible story, a real hero! Not just for the nation of Japan,but to his fellow comrads. But i just cant figure it out. If there is anyone i truly hate, its the Fascist Croations.Iam a veteren of the war in Bosnia, served 3 years,92 to 95, fighting against the Croats. The things they did during WWII,that even Himmler was in shock. Japanese people seem so peaceful and loving. I know many Japanese and i have been there. But i just cant put 2 and 2 together, the things they did to prisoners. I just cant figure it out! According to WW II Mag, his remains were found in an airplane crashed on a beach. I know this has got nothing to do with this article, but there should be a computer program stoping idiots like the one from the comment No. 1 posting on the net. Let me just remind you, you moron, that the Serbian, not Croatian army attacked Slovenia, then Croatia, then Bosnia, and at the end Kosovo. You were probably one of the 'brave' serbian soldiers in Bosnia killing unarmed boys and men in Srebrenica, or slaughtering the civilians in Sarajevo during the siege. Brave army you were, no question about that! comment 1 called the mastermind behind Kamikaze missions a hero. I dont know how killing over 1900 of YOUR OWN MEN to destroy only like 25 naval ships makes you a hero. 27. And pride, honor, and love of your country. Would you die for your beliefs?? hero???? On what planet? Ugaki's last thought was to see how many evil Americans he could kill before he was killed!!!! He took 20+ other Japanese airmen with him, for nothing. He was no Hero, nor was he a killer. He simply ended the war the only way he knew how, and all 22 of those men joined him on their own, Especially Endo. This was common "valor" in Japan, there are true stories of guys remaining at their post on some islands for years. One guy in the Phillippines for like 30 years, and he would only go home with an Order from his original commander. This was their culture, and was in place long before the Military folks took over in Japan. Of course we don't agree but it was their Culture, and it was embedded in all of their people. All (READ ALL) Countries have a past or part of their past (slavery ring a bell) that they would like to forget or these days erase. It's History, it's fascinating, and it should never be forgotten or erased. This man sent many good people to their death when he knew the war was lost . Many of the Kamikaze were university students with bright futures and they took a lot of young promising Americans with them . I would say Ugaki suffered from a dangerous and delusional pride he couldn't overcome . If he would have committed suicide before the war at least the people that died with him so close to the end of the war might have lived . R.T., I would like to remind you that the 11 escorts Ugaki had with him during his disobedient Kamikaze sortie were all volunteers. Ugaki did not want anyone else to join him in his final act. 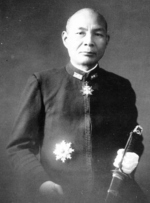 Many of the men disliked Ugaki for differing reasons, but volunteered in his final sortie out of hopes that their supreme sacrifice would bring honor and status to their families. The Japanese lived by much different standards, traditions, and cultures compared to the rest of the world. Did anyone look for his body on Hiroshima after the war?